Caroline and Joe’s wedding was another one of those for which it was difficult to write this post. Not because I didn’t have GAZILLIONS to say about their amazing details, the gorgeous day, or their impeccable taste; but because after working together for 18 months leading up to their wedding, this really signifies the end of the process. And that’s a hard pill to swallow. Caroline, Joe, and I began working together in December of 2010. 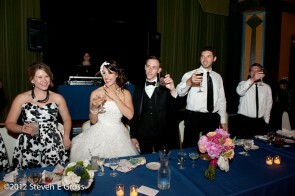 We searched high and low for their perfect venue, and when we came upon The Kenilworth Club we knew it was the place. The enchanting side yard where the ceremony would take place; the intimate feel of the reception area; the prairie-style architectural details…all love at first sight. 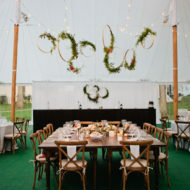 The couple used the space as inspiration for the rest of their event styling. 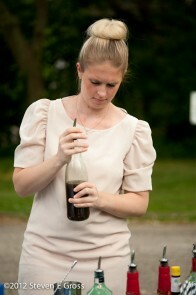 By wedding day, each of the included elements felt truly inevitable. 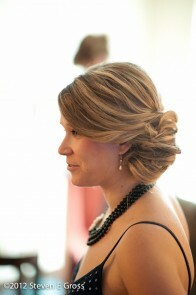 The couple chose not to see one another before the ceremony, so the getting ready period was really realxed! Caroline and her bridesmaids watched old movies and munched on snacks while Samara and Krystyn of Bridal Beauty Chicago gussied them up. 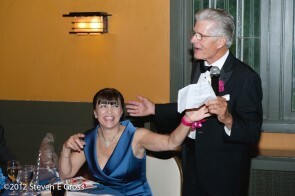 Steven Gross of Real Life Weddings was on hand to capture the action. Caroline’s dress was a stunner. I believe it was being compared to something Scarlet O’Hara would have worn. 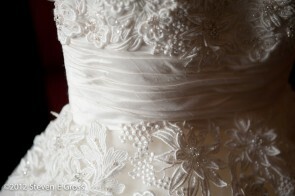 The beaded bodice was laid delicately over the cloud of tulle that made up the skirt. Her mom specifically asked that she be the one to help Caroline put on her dress. I love that the sometimes chaotic process of getting ready was made much more private and intimate–it set the tone for the day. Once on site at Kenilworth Club, we hid Caroline away in the bridal room while guests took their seats for the outdoor ceremony. 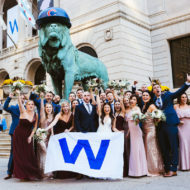 Joe’s father had constructed an amazing backdrop for the ceremony to mask the fact that they were facing a public street (who wants parked cars in their photographs?!). It did just the trick. Despite the cool palate color-scheme for the other wedding elements, Caroline chose to carry a multi-toned pink bouquet down the aisle. As a bride, I believe there are some liberties you should take for yourself, and carrying your favorite color–so you don’t subject your groom to a fully pink-toned wedding–is definitely one of them! 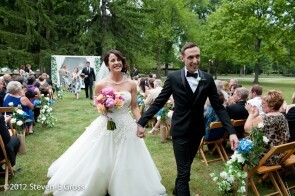 Fragrant Design did a wonderful job constructing the bouquet and all of the florals for the day. Their ceremony was officiated by the minister at Caroline’s childhood church–who flew all the way out from San Francisco to be there! 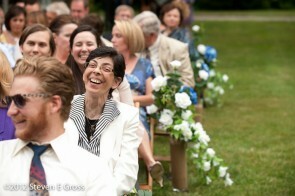 It featured readings by each of Caroline and Joe’s aunts and personal vows. 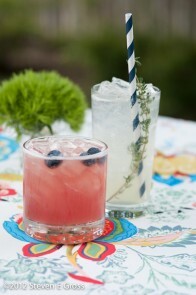 Caroline and Joe’s cocktail hour featured one of the coolest parts of their wedding: craft cocktails created by Femme du Coupe. 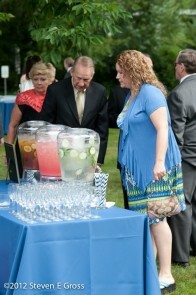 Revae came up with two brand new cocktails, just for Caroline and Joe, 2 self-serve punches, plus was ready to serve either a Moscow Mule or Old Fashioned to the guests! I also loved her selection of BBJ Linen’s Carlisle Lamour as a pop of color and pattern against the verdant grass and trees. Once inside the club, all of Caroline’s myriad details were revealed. 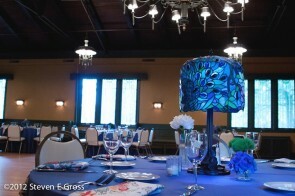 While half of the tables were adorned by elegant floral arrangements by Fragrant Design, the other half held stained glass lamps that Joe had adapted to use battery-powered lights. 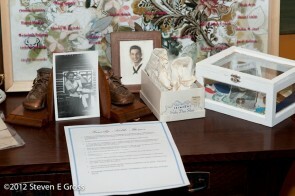 Instead of framed photographs, the couple collected mementos showcasing their families’ histories to display for their guests. Their placecards were arranged on vintage plates which later transitioned into their dessert bar. Everywhere you turned it seemed there was another element that showed a deeper connection between the event and the bride and groom. The meal, prepared by Hearty Boys, was just lovely and perfect for the season: an heirloom tomato caprese salad followed by a due of grilled pork and chicken with peach barbecue sauce and roasted summer vegetables. I’m hungry just thinking about it! The guests ate, chatted, and toasted the happy couple. 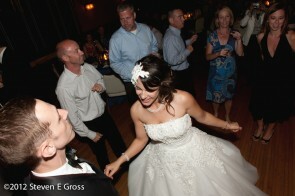 After dinner, Caroline and Joe kicked off dancing with their first as a married couple. Joe worked with DJs Kate and Rachel at Toast and Jam to keep his selection for the first dance a secret until wedding day. I loved the look on Caroline’s face when Sea of Love came through the speakers that evening. It was a very touching moment for everyone there! 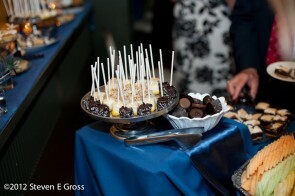 The rest of the evening was spent dancing and indulging in Hearty Boys‘ decadent dessert station. Caroline and Joe kept saying what an amazing time they were having. 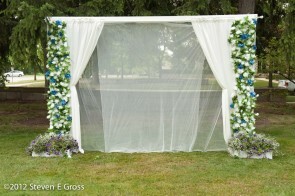 As a wedding planner, you can’t ask for more! 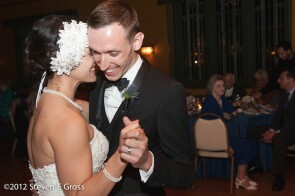 Caroline and Joe: I was so honored to work with you from start to finish on this beautiful celebration of your love. I am even more honored to call you both friends. I wish you both a lifetime of happiness together! Welcome to Five Grain Events, home of the detail-oriented and obsessive list-makers. 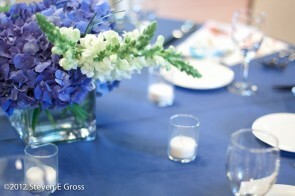 We love all the nitty gritty details that come together to create a flawlessly executed event. See our recent occasions here on the blog!